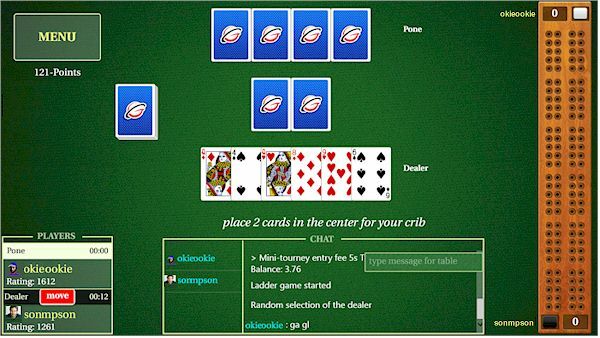 Cribbage Live Online is an app that can be installed on any Windows PC or tablet supporting Microsoft Windows 8 or higher version of Microsoft Windows. Cribbage Live Online is available from Microsoft Windows Store. With Cribbage Live Online you can Play cribbage and chat with real people, improve your skills and your rating and make new friends! The game features crisp and easy-to-use playing cards and it allows to play quite fast. 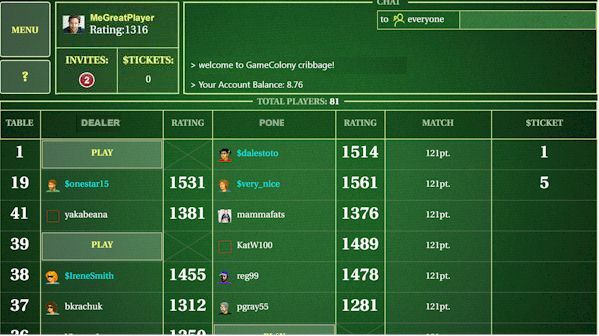 You can chat, compete and play internet cribbage games or tournaments. Cribbage game options include 121 point or 61 point games, manual scoring option and six-card and five-card cribbage options. A scrollable game room typically shows up active players and their tables like in the picture below. In the top-left corner of the game room, you can see your player account and your invitations. In the top right corner, you can see the scrollable game room chat. The main part of the game room screen shows players and their games. Open tables show 'Play' button. You can play, chat, watch other people play, select invitations, etc. The 'Menu' button is located in the very top left corner of the screen. Selecting a 'Menu' brings up a screen with actions that can be performed depending on the context. For example, if you are at a table watching a game, you can use the Menu to get out. You can use the 'Menu' in the game room to Create table, Exit a room, Look-up and change your player account information, etc. This is a view of a cribbage game in progress. You are a player in the bottom (with name: sonmpson) and it is your turn. The game prompt says 'Place 2 cards in the center for your crib'. The chat is under the cribbage playing area. It's a start of the game, and the cribbage board on the right shows the score of 0-0. You can, for example, 'grab' and move a card from your hand to the center. Move cards by double-clicking (for touch-enabled screens double-tapping) them.